Talmudist, rabbi, physician, and many-sided scholar; born in 1512; died at Cracow Dec. 13, 1585. Though of a German family (according to some, the relative of Joseph Colon; see Mortara, "Indice Alfabetico," s.v. ), he was probably born in the Levant, and received his Talmudic education under Joseph Taitazak in Salonica. Ashkenazi first became rabbi in Egypt 1538-60, probably at Fostat, where, by his learning and wealth, he became widely known. Compelled by circumstances—doubtless of a political nature—to leave Egypt, he went to Cyprus, remaining there for two years as rabbi at Famagusta. A desire to visit foreign lands and to observe foreign peoples impelled him to give up this position and to travel. He went first to Venice; but a disagreement with the rabbis, Meïr Padua and his son Judah Katzenellenbogen, caused him to leave the city and in the same year to take up his residence at Prague (1561). Here—either because he was a rabbi, or, at all events, because he was a leading authority—his was the first signature appended to the constitution of the burial society of the congregation. After leaving Bohemia and proceeding eastward as far as the Crimea, Ashkenazi returned to Italy, not before 1570. While rabbi of Cremona he published there (1576) his work, "Yosef LekaḦ" (Increases Learning; compare Prov. i. 5), dedicated to Joseph Nasi, duke of Naxos, which was several times reprinted. Four years later he was again in eastern Europe, as rabbi of Posen. In 1584 he left that city to take up his abode in Cracow. Ashkenazi's printed works, besides the "Yosef LekaḦ," are the following: (1) A commentary on the Book of Esther; (2) "Ma'ase ha-Shem" (The Works of God; Venice, 1583; several other editions), a commentary on the historical portions of the Pentateuch, written for the instruction of his son Elijah, and containing also a complete commentary on the Passover Haggadah, which has frequently been published separately; (3) eight "seliḦot" (penitential prayers), included in the Bohemian liturgy; (4) a "tokaḦah" (homily), published by his son. His supercommentary to NaḦmanides, and his critical marginal notes—said to number one thousand—on Joseph Caro's "Bet Yosef," have not been preserved. Though Ashkenazi can scarcely be said to have exercised an influence either on his own or on later times, his personality was an extraordinary one for that age. He may be called the last survivor of a most brilliant epoch in the history of the Sephardim. During a period when, in Germany and Poland, the hair-splitting dialectics of Jacob Polak could achieve a triumph, and, in Egypt and Palestine, the mysticism of Isaac Luria could confuse the clearest intellects, Ashkenazi preserved an impressive independence of thought. Although educated by a fanciful cabalist, and a fellow-pupil of Moses Alshech, yet he was a student—if not a deep one—of philosophy and physics. As a Talmudist, such men as Joseph Caro, Moses Isserles, and Solomon Luria considered him of equal authority with themselves; but when the rabbinical decisions of the old rabbis ran counter to sound judgment, he never sought a sophistical justification for them, as was then the custom, especially in Poland. Valuable material for a correct estimate of Ashkenazi may be found in several of his decisions preserved in the responsa literature of the time. In Venice he decided that a man could be forced to a divorce, if, by immoral conduct, he had incurred his wife's aversion (Isserles, Responsa, No. 96). It was probably this decision which brought upon him the opposition of the above-mentioned Venetian rabbis, though he was connected with them; for Ashkenazi's son was Katzenellenbogen's son-in-law. From the standpoint of strict Talmudic interpretation, Ashkenazi's opponents were in the right; since his sentence contravened that of the Tosafists, who for the German-Italian Jews constituted, as it were, a court of last resort. The Jews of Poland were still less capable of comprehending such a personality than were those of Italy. The following occurrence affords a striking instance of this fact: The "roshe yeshibot" (heads of academies) had forbidden their pupils to establish a rival academy in close proximity to their own. Ashkenazi declined to assent to this resolution, when requested. At the same time, he complained in a letter to Joseph b. Gershon ha-Kohen, the "rosh yeshibah" at Cracow, that, although the decision of the Polish rabbis was based upon the authority of Maimonides, yet he considered it irreconcilable with freedom of instruction among Jewish rabbis. How little he was understood by his Polish colleagues is fully displayed in the reply of the rabbi of Cracow, who at great length vindicates Maimonides' standpoint by erudite and astute references to the Talmud (Joseph b. Mordecai Gershon, "She'erit Yosef," No. 19). 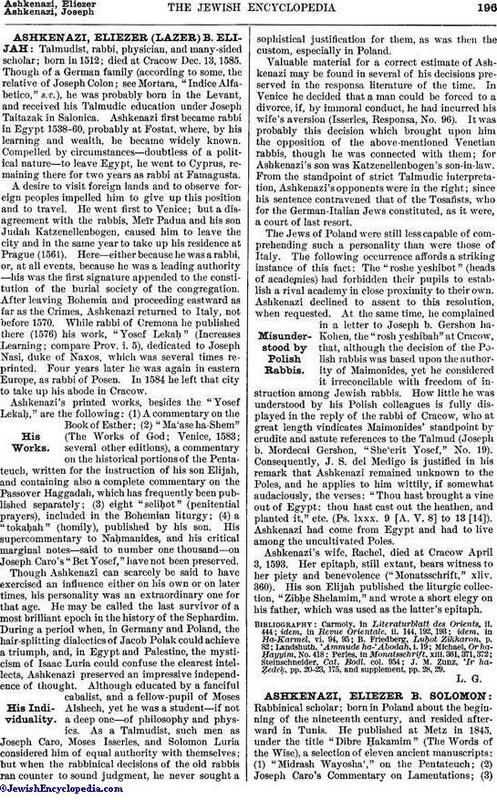 Consequently, J. S. del Medigo is justified in his remark that Ashkenazi remained unknown to the Poles, and he applies to him wittily, if somewhat audaciously, the verses: "Thou hast brought a vine out of Egypt: thou hast cast out the heathen, and planted it," etc. (Ps. lxxx. 9 [A. V. 8] to 13 ). Ashkenazi had come from Egypt and had to live among the uncultivated Poles. Ashkenazi's wife, Rachel, died at Cracow April 3, 1593. Her epitaph, still extant, bears witness to her piety and benevolence ("Monatsschrift," xliv. 360). His son Elijah published the liturgic collection, "ZibḦe Shelamim," and wrote a short elegy on his father, which was used as the latter's epitaph. J. M. Zunz, 'Ir ha-Ẓedeḳ, pp. 20-23, 175, and supplement, pp. 28, 29.